This is my last mani from June. It's the smurfs! 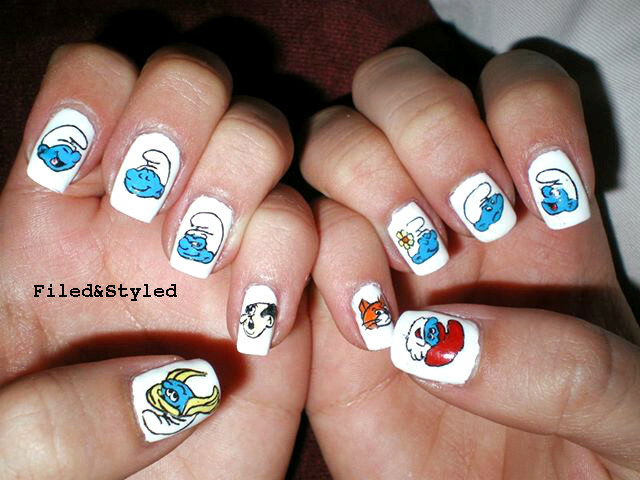 I'm surprised that I could fit Gargamel and Azrael on my pinkies. I have really narrow nail beds' here's a picture of my pinky next to a dime. I wish I had a bit bigger nail beds, because then I'd have more canvas to do my art. Anyway, here we go! Again, all these pictures are a bit blurry and not color accurate because I never thought I'd be posting on a blog. White - Essie Blanc. I'm officially in love with Essie. This is the only white that I've been completely satisfied with. Acrylic paint for the characters.